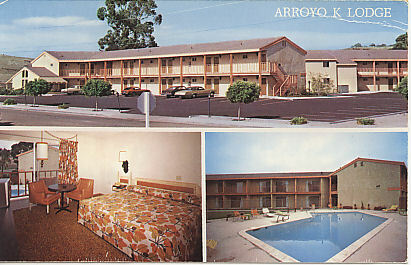 "Arroyo K. Lodge - Arroyo Grande, CA - C 1970. " (1852) POSTCARD: Arroyo K. Lodge - Arroyo Grande, CA - C 1970. -Condition: Good. - Has Not been Posted. Photo of front of motel with cars, one room, and pool. Upper left corner has a crease. Price: $2.00 + shipping.